Winner has operated a respected casino, poker room and bingo room for years and relatively recently it launched its bookmakers which quickly gained an excellent reputation in the industry. The operation is fully licensed and it is known as a trustworthy site to place a bet. This site is available in a variety of languages and will accept bets from customers all around the world. Winner caters to fans of almost every kind of sport. The default format for odds is fractional;however, players who prefer decimal or American formats can easily switch to their preferred view. It offers a huge range of betting markets on a total of 26 different sports, from snooker to MMA to football. Furthermore, it also runs numerous betting markets on reality television shows, award ceremonies and political events. A nice addition to the Winner website is the Live Audio Centre. Here you can listen to live commentary on a huge range of sports events, Horse Racing, Football and also Sky Sports News Radio. Best of all, while listening to the live commentary you can keep track of all the latest in-play betting odds. There is also a special ‘Soccer Saturday’ radio station for monitoring all the weekend football as it happens. As the name suggests, Winner runs numerous promotions to help make sure that you come out on top. For instance they offer multiple insurance which is fantastic for those that bet on combos. It means that you will get your money back on 5-folds if one match lets you down. The promotion is valid for straight accumulator bets of 5-folds 90 minute match betting. Those who enjoy gambling on the Premier League will also benefit from betting at Winner. Place a pre-match First/Last Goal scorer or Correct Score bet on any game and if a team comes from behind to win Winner will refund any losing bets on the match. Many punters love keeping track of all the latest scores and statistics from the sports world. 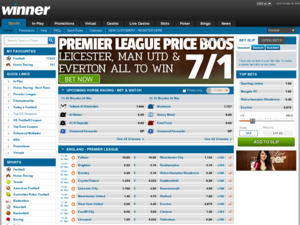 At the Winner bookmakers website you are sure to find all the details you could possibly need. For any given sport you will find a comprehensive list of team and player statistics and the latest results from around the world. It is even possible to browse statistics going back ten years. A particularly useful feature of this site is the ability to compare the stats of any two teams, this way you can be sure you’re up to scratch on all previous results before betting on a match. Impressively, while so much information is available, Winner has managed to present it all in an extremely user friendly and accessible format. Winner offers free customer support 24/7. The customer support team can be contacted through a variety of methods: live chat, e-mail or phone. The team will do its upmost to help you and answer any queries you have as fast as possible. The one limitation is that for the time being customer support is only available in the English language. This is an area where Winner truly excels. There are over 40 different ways to make deposits and withdrawals. There are local payment options for customers in the UK, Canada, Australia, Germany, Austria, Spain, Poland, Russia, Sweden, Denmark, Norway, Finland, Belgium, Greece and many more! With so many local payment options it is no surprise that Winner accepts loads of different currencies such as Australian Dollars, Norwegian Kroner, South African Rand, UK Pounds, US Dollars, Euros etc. etc. etc. The full list of deposit options is far too long to list here, however, in addition to accepting all major credit and debit cards there are numerous eWallet and ePayment options available. The withdrawal service is equally impressive. Services such as Click2Pay, Neteller, ClaickandBuy and of course Visa and Mastercard are available. Many of these options will see the money appear in your account immediately while the slowest will only take up to five business days. Overall WhoIsTheBestBookmaker.co.uk gives Winner extremely high marks. It is an exceptionally professional institution which offers a truly comprehensive set of betting options. The website is definitely best used by punters in the UK as this opens up the full range of promotions. However, regardless of where you are from there are still some extremely generous bonuses to take advantage of. Similarly, while it would be nice if they released a mobile app, the actual website is very easy to use and moreover is exceptionally reliable, fair and most importantly safe.